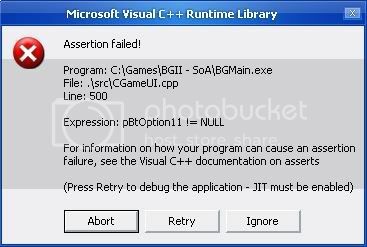 TobEx (Throne of Bhaal Extender) is a dynamic link library (DLL) written in C++ that fixes game engine bugs and extends the game engine by modifying the virtual image of the Throne of Bhaal BGMain.exe in memory. The first component labelled "TobEx - Core" is the minimum requirement to use TobEx. This component installs all the files required to use TobEx. Instead of always being interrupted when hit, spellcasters have a chance of their spells being interrupted. This is governed by a concentration check. A spellcaster passes the concentration check if (1D20 + luck) > (spell level + damage taken). The details of this component are subject to change. Creatures will awaken from sleep when hit. Blindness gives -4 to hit and 4 point armor penalty as per the Blindness spell description in the game. Removes grey colour change to a character who has cast Stoneskin. [C] This component is identical to tob_hacks, SCS, and SCSII. Spellcasting is not interrupted if a creature takes zero damage (i.e. immune). When trying to dispel Mirror Image, the chance of dispel is modified by the caster's level. [C] This component is identical to tob_hacks, SCS, SCSII, and Spell Revisions. Enables all races to dual class, rather than just humans. Enables changing armor during combat. Disables the hard-coded feature where the party gains 110% of the experience actually coded in creatures. In single player, if the game is unpaused before entering the inventory screen, the game will not automatically pause. 1. Prevents creatures from losing their soundset when they are charmed. 2. Enables the player to start dialogue with charmed creatures. Restricts the number of proficiency stars that can be given into one proficiency during character generation for level one characters. This component only has an effect on people who play Baldur's Gate Trillgy-WeiDU. If a character is invisible or improved invisible, a successful pickpocket does not break invisibility. Hide In Shadows will still terminate at the end of the round. [C] This component is NOT compatible with tob_hacks. If resting is interrupted by spawns, a random amount of time up to, but not including, eight hours will pass. All resting times of one hour or greater will display in the dialogue bar. Resting times less than one hour will not display in the dialogue bar. Similar to Baldur's Gate I, this component displays the greeting string reference in the dialogue bar when initiating dialogue. This component enables animation-specific attack sounds, which makes combat a little more polyphonic... perhaps musical, or messy. Gives all playable classes four weapon slots in the inventory like fighters. This only changes the inventory display and not the quick bar at the bottom of the screen. In three separate components, whenever a creature dies by disintegration, shattering cold, or shattering petrification, all inventory is dropped just like dying normally. In single player, auto-pause will work when the player is currently viewing any screen. Previously, auto-pause would only work in single player when the player is currently viewing the main game screen. Removes all the 'fake' attacks, where creatures would display an attack animation, but would not actually roll to hit. This utility will not install on other versions of Throne of Bhaal. This utility will not work on Macintosh systems. 1. Extract the TobEx_<version>.rar archive to your game directory. 2. Run Setup-TobEx.exe in the installation directory. 3. Follow the on-screen prompts to install, re-install, or uninstall components. 4. Install all your other modifications. 5. Start the game normally by running BGMain.exe. 6. You will know TobEx is running in the background if an extra console window pops up before the game starts. If this does not occur, you can start the game using TobExLoader.exe instead. First, make sure that TobEx is actually the issue. You can forcefully disable TobEx from running by renaming TobEx.dll in your game directory. 1. Open TobEx_ini/TobExCore.ini in a simple text editor. 2. Under the [Debug] section, set all values of 0 to 1. 3. Try to reproduce your error in-game. TobEx may sometimes reports some extra information about the error. 4. Report any errors you find on the Spellhold Studios forums. Expect to be asked to attach a .zip of your saved game folder, WeiDU.log, TobEx.log, TobExCore.ini, and TobExTweak.ini. If this is the case, installation automatically detects if an update is necessary and updates accordingly. Installation will continue without any changes if no update is required. There is no requirement for any special user action. It is recommended that TobEx be installed as the first modification in a multi-modification installation. TobEx may have compatibility issues with mods that directly modify the executable. Please apply the troubleshooting tips above if you are having trouble and believe you may be experiencing compatibility issues with other modifications. Please see TobEx/TobEx_redist/readme/readme.txt for more information. The source code for the program is included with compile notes in the ./TobEx/src directory. Edited by Ascension64, 24 March 2013 - 05:24 AM. I also noticed that the drwtsn32 debugger fires up for a moment when it crashes, and then goes away. And the baldur.err and .log don't have anything to say other than ".... Start Logging Session ..."
Wow. Between this and Infinity Animations, we are truly living in exciting times for BG modding. So many more possibilities becoming available. Meddling in the affairs of modders. Modding in the affairs of genie. If you get a Windows exception error box, click on the hyperlink. Can you tell me what the values of ModName and Offset are? Otherwise, perhaps I haven't included all the right DLLs. 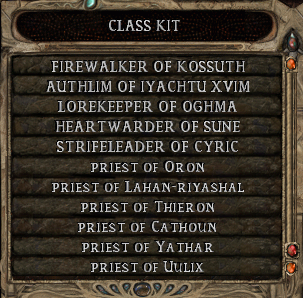 Try putting these extra ones in the BG2 install directory. Edited by Ascension64, 24 February 2010 - 01:01 AM. Edited by Lollorian, 10 December 2009 - 08:04 PM. OK, I updated the download a bit. Give it a try now. That'll teach me to assume memory offsets are static. And it turns out that I did implement version checking, so if you do use a BGMain.exe other than 26498 the loader will tell you you have the wrong version. Edited by Ascension64, 10 December 2009 - 11:10 PM. Edited by Lollorian, 10 December 2009 - 11:26 PM. Injecting and hooking would allow for so many more exiting mods... this could very well be a great step in modding the infinity engine. i uploaded a final alpha version - has a small fix so dragging the slider works correctly - and has a readme. I think it is OK, but I would be cautious when using this with Taimon's hacks - his SONGLIST.2DA patch may conflict with this one, so don't use them together. I had considered coding his hacks in to eliminate the need for mass EXE patching, but I just don't have the time to work on this. It is true that like OBSE is to Oblivion, TobEx is to ToB. You can add all kinds of things - new effects, new script triggers and actions, new GUI options, etc. And it is clean, it does not hard-code any changes, and the worst thing that happens is that the game crashes. For some things like kit selection, you don't even have to be forced to use TobEx the whole time - just start the game with the loader, choose your kit, then every subsequent time you play, run the game without the loader. If in time we start adding new effects etc., then TobEx becomes a staple requirement to launch such a modded game. The project did involve quite a bit of reversing, and all the kit work here involves fully reversed functions in the game. The downside is that it is extremely time consuming (as Taimon would testify as well), which is why I cannot work on this project anymore. I release this in the hopes that someone would be willing to pick it up and do something fantastic with it. Oh well, that's it from me then. Edited by Ascension64, 11 December 2009 - 04:06 AM. Nifty. Is there a maximum number of kits displayable now, or is it theoretically unlimited? Theoretically unlimited. I do not know if BioWare puts a limit on the 2DA row count size. Congrats Ascension64, I'll definitely have a look at this. Sadly, like yourself, I currently don't have much time to work on the Infinity Engine. However, mine fails to start xD I'm running Windows 7 32bit and I get a "FindFirstFileA: the system can not find the file specified" error. Is this because I installed the widescreen mod first? Anyway, disregard this, as BG2 itself doesn't start anymore either I merely performed a BWP installation, then ran your launcher... Should I have first tried running BG2 before using the launcher or is it impossible to have affected anything? When trying to run BG2 the normal way, it just doesn't do anything after I click on Play. The .chu file is placed in my override. Turning off KitScroll fixes the bug but obviously doesn't allow me to scroll through the list of kits. 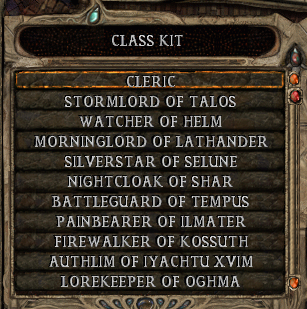 Classes with nine kits or less, so no scrolling, do work. If you need more information, I can try to provide them. Make sure that the TobExLauncher.exe, and all the other files in its archive directory, are in the same directory as the BGMain.exe. The error occurs because it cannot find your BGMain.exe. Make sure you put guicg.chu into your override directory. Ive edited the ini so the only thing active is the Kit scroll screen, however i too get the the C++ error, even though the guicg.chu file is def in my override directory. Edited by pauljh5, 31 January 2010 - 11:21 AM. In simplification, the error states that it cannot find a reference to the extra button that TobEx adds in the guicg.chu file. Could you double-check that the ./override/guicg.chu file from the TobEx.rar is the one that is in your BG2:ToB override directory? Also, check that no override sub-directory has been created in the override directory. I can reproduce this error if: 1) I don't have a guicg.chu in the override directory; or 2) a guicg.chu that doesn't come from TobEx.rar is in the override directory. Also note that certain GUI mods might modify guicg.chu in some way. If there already is a guicg.chu in the override directory, try re-extracting the one from the TobEx.rar into the override, making sure you backup the old one. Just re-did all that again just to be sure, but no change. My install path for BGII is C:\Games\BGII - SoA\override and there is definitely the guicg.chu file there, and the .chu is definitely the exact one in the rar above. There is no visible or hidden folder in \override at all either. ive recently installed the game itself. I have ToB installed and patched it up to the correct version and did a BWP 'standard' installation. Ive added some kits, then installed this to the instructions above. Edited by pauljh5, 30 January 2010 - 09:28 PM.